Virtual Office Raleigh, a brand new, free standing building with ample parking and a full floor of executive office suites at your disposal. Located next to the Crab Tree Valley Mall and only 20 minutes driving time from the Raleigh – Durham International Airport . The facility allows quick access over Interstate Road 440 and Glenwood Ave, the generous parking area allows for swift arrival and departure and will save a lot of traffic related time. The Business Center welcomes you with a friendly reception area, always representing you in your companies name, even if you are not there. The private offices are fully furnished and serviced and can either be leased full time or by the hour, half a day, full day. Multiple conference rooms can also be utilized as needed, you just pay for the exact time you occupy the room. 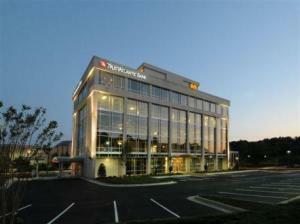 Our professional staff at Virtual Office Raleigh will assist you in all your business related needs. Whether it is phone answering, transfer of calls and message taking, word processing or data entry, you can hire our staff by the hour and they are at your service. All without ever having to deal with the payroll, employee taxes and management related issues. Getting started is simple, you can just chose the location you are most interested in, add any of the additional services like phone answering services, as you need it and follow the checkout process. For more detailed information or to schedule a tour to see this facility, please call 1.866.793.7969. You may also inquire by clicking the button below this description.